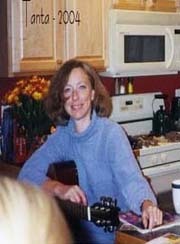 Calculated Risk: What is a depression? Yesterday I heard an analyst say that a 10% unemployment rate is a depression. But the unemployment rate peaked at 10.8% in 1982, and that period is usually not considered a depression. Some people argue the duration of the economic slump defines a depression - and the current recession is already 15 months old. That is longer than the recessions of '90/'91 and '01. The '73-'75 recession lasted 16 months peak to trough, and the early '80s recession (a double dip) was classified as a 6 month recession followed by a 16 month recession (22 months total). Those earlier periods weren't "depressions", so if duration is the key measure, the current recession still has a ways to go. 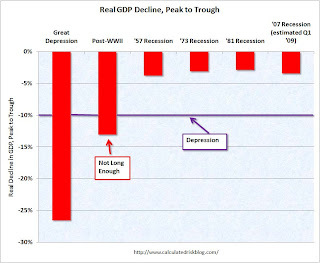 Here is a graph comparing the decline in real GDP for the current recession with other recessions since 1947. Depression is marked on the graph as -10%. Q1 2009 is estimated at a -7.0% decline in real GDP (Seasonally adjusted annual rate). This will push the cumulative decline (peak to trough) to about 3.4%. 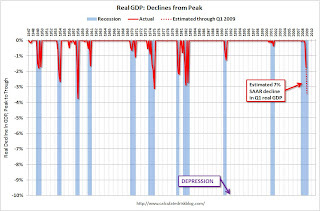 Even though the current recession is already one of the worst since 1947, it is only about 1/3 of the way to a depression (assuming a terrible Q1). To reach a depression, the economy would have to decline at about a 6.6% annual rate each quarter for the next year. The second graph compares the current recession (estimated through Q1 2009) with the more severe recessions of the last century. Note that the data is annual for the pre-1947 economic slumps. The Great Depression saw real GDP decline 26.5%. The post-WWII recession lasted 8 months and saw real GDP decline 13%. This decline in GDP was due to winding down the war effort - something that was celebrated - and is excluded when analysts call the current slump the "worst since the Great Depression". As I noted last weekend, business cycles have a typical pattern (see Business Cycle: Temporal Order). Housing and personal consumption usually lead the economy out of recession - and both of these areas will probably be slow to recover this time. The following table and text are an excerpt from the previous post. The table shows a simplified typical temporal order for emerging from a recession. This business cycle there are reasons that housing will not be a significant engine of recovery. It is possible - see Looking for the Sun - that new home sales and housing starts will bottom in 2009, but any recovery in housing will probably be sluggish. At least we know what to watch: Residential Investment (RI) and PCE. The increasingly severe slump in CRE / non-residential investment in structures will be interesting, but that is a lagging indicator for the economy.